The YMCA branch serving the communities of San Ysidro, South San Diego, and Southwestern Chula Vista announced the arrival of its new executive director this week. Through a press release from the YMCA of San Diego County, Gaby Millan was presented as the new head of the Border View Family YMCA. Millan, who grew up in the nearby community of Del Sol, was selected after the a nationwide talent search. Millan began her career at the Y during her undergrad days at Cal Poly Pomona, working at the Fullerton YMCA campus in Orange County during after school hours. From there she would later work at the Chula Vista and Eastlake YMCA branches as membership director. She also served as regional director of membership and health and wellness. Within the branch she now directs, Millan has been in charge of membership and took up an interim tenure as executive director for three months, while the search for someone to fill the position was conducted. Now, in her newly-minted role as executive director, Millan believes that reaching this position is like a way of coming back home. The Border View YMCA is located at 3601 Arey Drive in South San Diego. 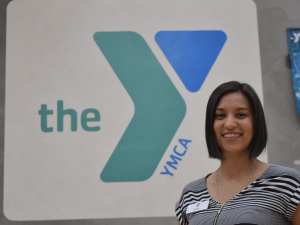 I have known Gaby from her early years at the South Bay YMCA and could not be happier about her new role as the Executive Director at Borderview YMCA. She is a woman of character who understands the needs of the community she serves and has the heart and drive to make positive changes. Best of luck to Gaby! San Diego Unified School District has a great partnership with the YMCA to increase awareness of healthy living, provide opportunities for improving personal health, and strengthen the quality of life in our communities. Congratulations from the Palomar Family YMCA in Escondido! Gaby Millan is one of the very best YMCA professionals I have ever known and I could not be prouder to call her a friend. The Borderview YMCA is very fortunate to have someone who understands diversity and inclusion on such a personal level along with the intricacies of the community she now serves. Congratulations Gaby!